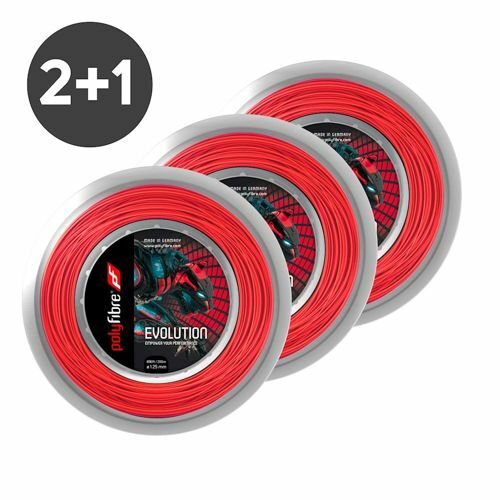 The string manufacturer Polyfibre has developed an excellent stringing process with ""Evolution"" which enables particularly technically adept players to make the most of their skills. Polyfibre consulted the Spin doctor himself for Evolution. His prescription for more swirl? A mechanically incorporated device which reaches deep into the felt ball. With the Evolution you will send curves that drive your opponent right off the court. The new Molecular structure (SMD) assures more comfort and control. Incorporated SMD technology assures that Polyfibre Evolution guarantees first class stability and is at the same time arm friendly. This benefits in particular players who want more power in their shots. A further highlight is the so called Snap-Back-Effect which in the build up of Spin increases control. The string is available in 1.20, 1.25 and 1.30 varieties. Trap this power in your racket now and even so enjoy maximum comfort! Durable stringing for ambitious players. Snap-Back-Effect prevents the strings from slipping. Strings of Olefin- Polymer with Corona coating.